The idea of privilege and understanding one’s true intent when volunteering their time and efforts was one that resonated with me today. Throughout the entire day, I encountered a variety of different people that said things that stuck with me. One of these people was a volunteer here at St. Andre’s who shared her experience about being a previous guest of this organization. At St. Andre’s, the staff and volunteers refer to these people who are homeless who use their facilities as guests in order to give them back their sense of dignity as a human, which they rightfully deserve. She talked about how she had so much gratitude for everything that the organization had done for her and how she wanted to give back to those who were in the unfortunate circumstances she had previously been in. I saw how much this volunteer was genuine about her intentions. Her experience with homelessness had allowed her to empathize fully with these people who are currently homeless using St. Andre’s facilities because this place had touched and helped her during what I would assume was a dark period in her life. It really made me think introspectively more about the intent of me being here and what the purpose of this immersion experience truly was. Yet while I was able to encounter such a wonderful woman like the volunteer here at St. Andre’s, I also encountered a woman who, although probably had pure intentions, seemed to treat her volunteering efforts in a more selfish way. During the Oregon Food Bank packing session, this woman was talking about how she would semi-regularly bring her and her family to volunteer at this facility. But in her response, she kept emphasizing how this “made her feel good about herself”. It was something that stuck with me because I feel like many times, people with a sizeable amount of privilege will discuss certain issues regarding marginalized communities or people who can’t necessarily advocate for themselves in a way that focuses more on themselves. For example, people will talk extensively how they are such good people for being aware of certain social issues, thereby focusing less on the true problem. It comes off as them having a savior-complex and only willing to educate themselves and be aware of certain issues for the sake of their reputation. Yet I know that while although some people who are volunteering may come off as arrogant, they are just unaware about the bigger picture and the complexities about certain situations. I know this for a fact because we all, myself included have been there. But it is important for us to be open-minded and try to understand the experiences and circumstances of others. It is not enough to just volunteer at your local food bank sometimes and then call it day. It is up to us to be more aware of privilege, how we can use it to benefit those that they may need it, and willing to learn so that we can better value the dignity of all humans. 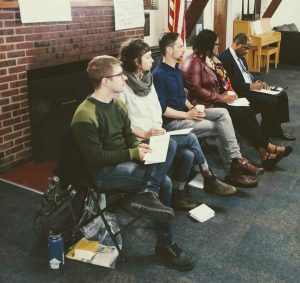 Today we gathered from across the country, ending our winter break early, to delve into the lives of those who are houseless. We all come from a variety of experiences and backgrounds, and today we shared our hopes, dreams, and aspirations for this week. We come into this week with welcoming, open hearts ready to learn and grow from the stories and the people we will meet. The first two people we meet our coordinators with Saint Andre Bessette Catholic Church, Andrew and Deonna. They graciously have let us into their space and have welcomed us the same as they would any of the other guests they serve with their hospitality services. Under their direction, we toured many of the resources that aim to help those who are houseless in the Old Town district. This was an especially eye opening experience for me personally, as I was pleased to learn how many services there were available for their guests. However, this also made me recognize how damaging the houselessness is in the area. I have walked through Old Town many times in my life, but this time was like any other in my life. Looking at Old Town with this new perspective will change me forever. In the past I might have been able to look over the houseless and keep moving but now I am beginning to develop a new and much more empathetic view. Society has tried to strip the humanity away from these people in many ways to the point that many people do not see them as equals. Even the way we talk about people who are houseless does not give them the proper humanity. When we often talk about houselessness we use the word “Homeless people”. This type of language connotates that their only quality is their houselessness. Not funny, smart, kind, loving, or any of the other thousand adjectives available in the human language, but rather the one word that put them at the lowest common denominator. I challenge those at home to think critically about the language you using surrounding houselessness, because the more we are able to empathize with these people the better we can help them. Follow along with us from January 9th-12th, 2019 as we are on our Urban Immersion and publish blog posts here. Look for more soon! 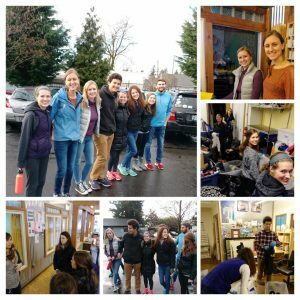 This is my post-immersion project for my Urban Plunge in Portland, OR, from January 10-13, 2018. 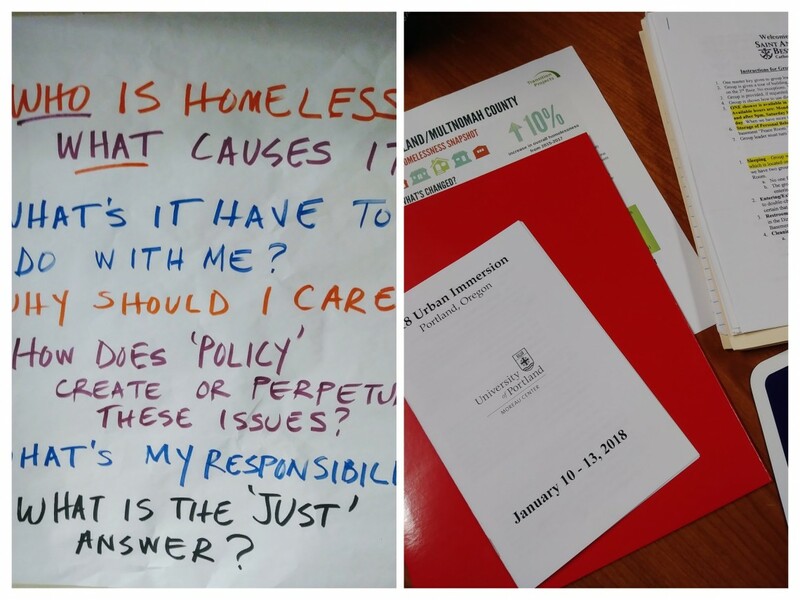 I explored issues of poverty and homelessness through the eyes of CST during my immersion. On the final day of the Urban Immersion, we were blessed with a tour of Right 2 Dream Too, an intentional camp site (and a nonprofit organization) that provides refuge and a safe space (Tiny Homes) for Portland’s unhoused community to rest or sleep undisturbed. Our enthusiastic and very knowledgeable tour guide was Tony, the primary builder (and also a resident) of the site. Could students help design and/or build tiny homes as a volunteer or capstone project? Does Physical Plant have surplus or unused materials it could donate? Might students take volunteer shifts at the camp? 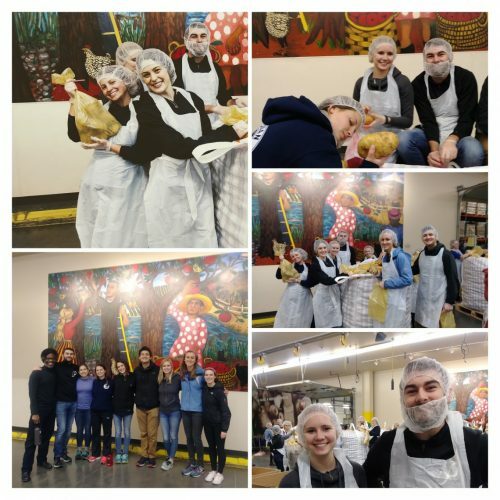 We had so much fun volunteering at Oregon Food Bank sorting potatoes! We had to double-wash our hands, wear gloves, and don hair/beard masks for food safety. There also was time for a tour. The Oregon Food Bank has massive impact on addressing both the need for emergency food boxes for people in crisis across Oregon and Southwestern Washington and in specific actions at the legislative level to address the root causes of hunger. 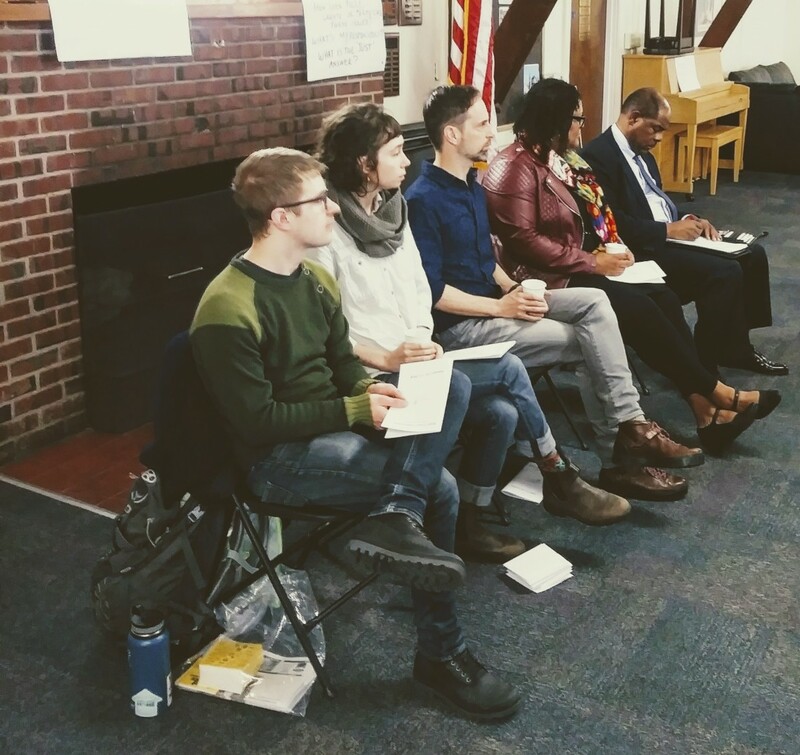 We’re so thankful and grateful to our guest panelists who made time to share with us today. We were blown away by their generosity, passion, and enthusiasm for addressing the real issues impacting our human family, and how we all have a moral mandate to act in response to these threats. Cole Merkel is Vendor Program Director for Street Roots, an organization that creates income opportunities for people experiencing homelessness and poverty by producing a weekly street newspaper. The paper is sold by members of the local homeless community and is published on Fridays. Vendors receive 75 cents for every $1 paper they sell. Shannon Cogan is Community Engagement & Board Liaison for Sisters of the Road, a nonprofit Cafe in Portland’s Old Town neighborhood working to create systemic change that will end poverty and homelessness forever by providing nourishing meals in a safe, dignified space. Michael Buonocore is the Executive Director of Home Forward (formerly the Housing Authority of Portland), the largest provider of affordable housing in Oregon. Home Forward serves all of Multnomah County, including the cities of Portland and Gresham, since 1992. DeWanna Harris is a Mentor Program Manager for Transition Projects, a leader in transitioning people from homelessness and living on the streets into housing. It operates and manages nine unique locations as well as facilitates hundreds of apartment placements each year. Greg Baker is Executive Director of Blanchet House, the largest meal site in the city of Portland. The agency serves three free hot meals each day, six days a week, to the homeless, low-income, and working poor of Northwest Portland. In addition, it offers transitional housing for men looking for a clean and sober living environment. 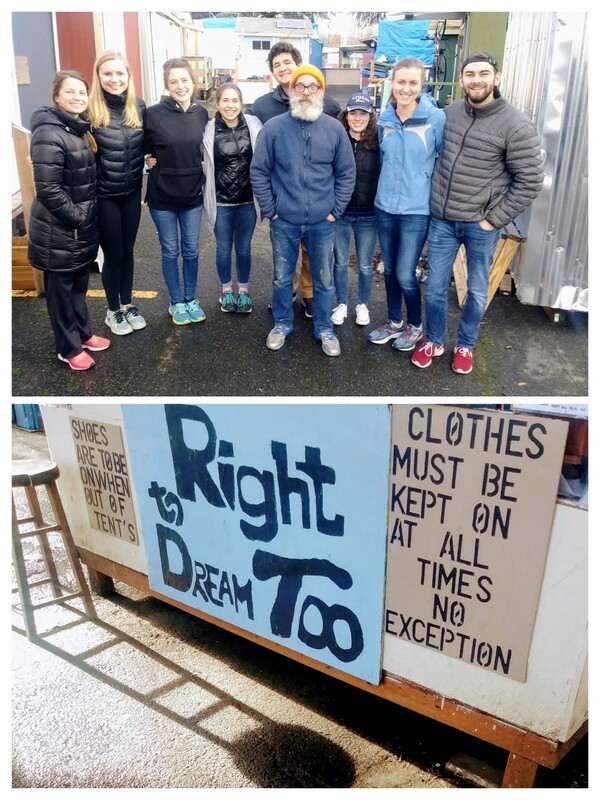 Sorting donations and meeting with Development Director of JOIN Sydney Linden really opened our eyes to what it takes behind the scenes to operate a busy nonprofit with limited resources. JOIN helps folks transition out of homelessness into permanent housing. Pope Francis joins Portland Urban Immersion! It’s Day 1 of the Urban Policy Immersion! Yay! Isn’t it wonderful Pope Francis was able to join us? Who is homeless & why should I care? 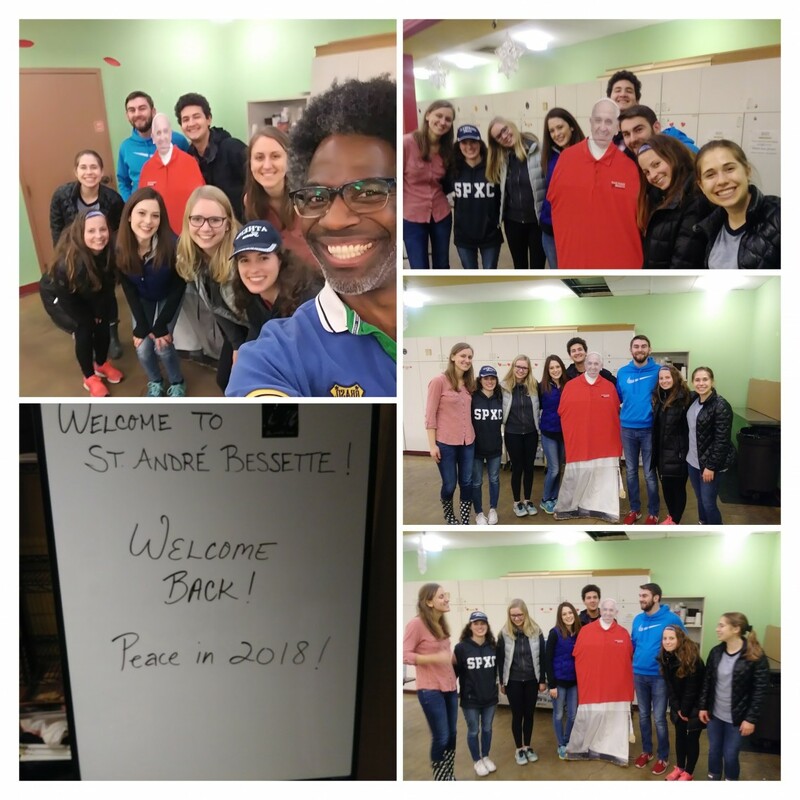 Before heading out to Saint André Bessette where we’d be staying for the next few days, we watched American Winter, a documentary that really challenged our idea of who is homeless! Swirling in our minds are questions like What does a homeless person look like? Can you even tell? What causes it? What can we do to end homelessness? Is it even possible?